I didn’t like this book. And, although I’ve only read one of her books, I’m not sure I’m a fan of Gillian Flynn’s writing. There is no doubt that Ms. Flynn is a popular, accomplished author, with a very strong following. And believe me, as a struggling writer I aspire to that, and I look up to her. She did it! And I am in awe of her. But not of this book. 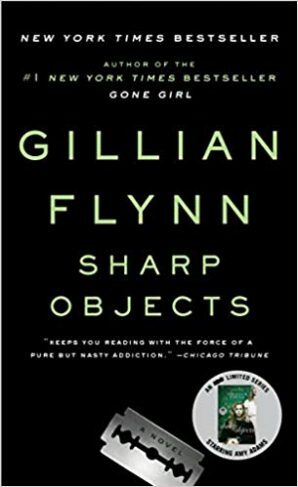 In a word, after all the hype about Ms. Flynn’s novels, and about Sharp Objects in particular, I confess I was disappointed. I mean, HBO turned the book into a miniseries. And Ms. Flynn is known for her prowess as a psychological thriller author. How could I be so late to the game? (No, I haven’t read Gone Girl, either). So I was truly excited to dive in, especially when someone very close to me thought it would be right up my alley. Perhaps it’s because I couldn’t find a single redeemable character in the whole story. Or, maybe it was because I found the protagonist to be so utterly stupid in her choices. (Seriously, you’re in your 30’s and you’re going to let a 13-year-old convince you to go to a high school party for booze and drugs? Oh, you are? Okay.) It also could have been my distaste for how the big reveal was delivered. I had kind of figured out the twist somewhere around halfway through the book, and I hate that! But I think the most difficult thing for me to understand was the style in which this book was written. The sentences, almost all of them, were incomplete, halting, jarring. Now, I will of course give credit where credit is due. Perhaps Ms. Flynn is so brilliant that even the structure of her sentences serves to make the reader feel as isolated as the protagonist. If that’s the case, then bravo, Ms. Flynn. Bravo, indeed. But I have no way of knowing if that was intentional or if it was simply a writing style that I did not connect with. Obviously this review is going to do absolutely nothing to Ms. Flynn’s meteoric success, and I certainly wouldn’t want it to. She’s found a genre that people really enjoy, and I respect and admire her for that. I just don’t think this book was for me. There are very few books in this world about which I would say “don’t read it.” And I’m certainly not going to say it for this one. Though it was not my cup of tea, I think it goes without saying that fans of anything written by Paula Hawkins and Ruth Ware would enjoy this. But if you’re looking for a psychological thriller that I did enjoy, check out Dismantled by Jennifer McMahon.